I love working with Lauren's Templates! I have at least 5. My current fav is the Rounded Wrap Up--I've made 3 this week! Your box is decorated so beautifully! 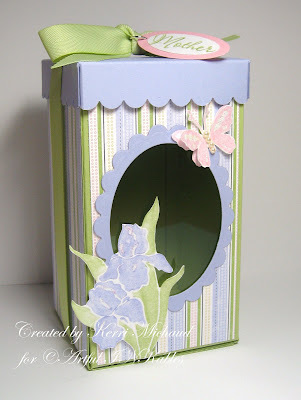 Kerri this is wonderful, love this box and the soft colors! Love the box!!! I love the oval, will have to try that next! I just got that template and started playing with it today! Thanks for more inspiration! This turned out fabulous! I love the butterflies and flowers that you paired up with the paper. This is a great Mother's Day gift box. It's so pretty. BEAUTIFUL Box, Kerri! Love the wonderful colors you chose! Your work is stunning! Kerri, what a wonderful keepsake box for Mother's Day! Perfect in every way! this is jaw-dropping stunning!!! your colors are so soft and beautiful! Lauren has the best templates around, without a doubt.